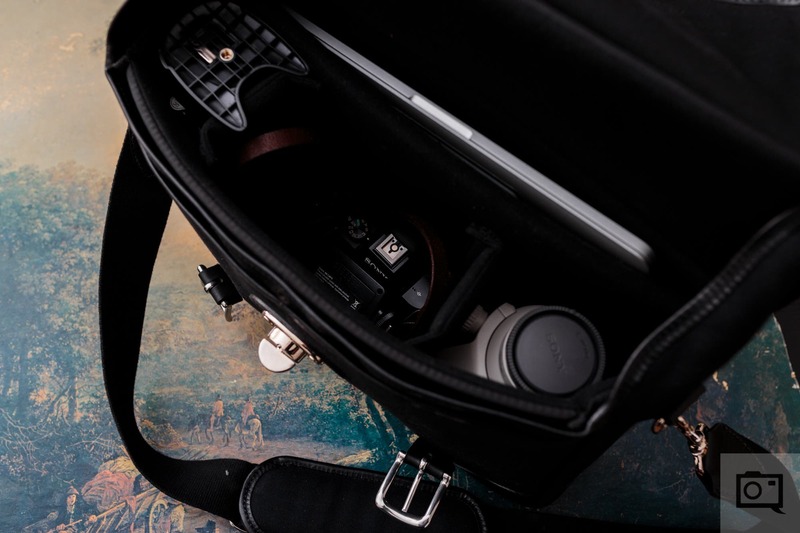 If there’s any place that photographers typically go to on the web to find out more about the latest and greatest camera bags, the two biggest sources are the Phoblographer and Steve Huff. 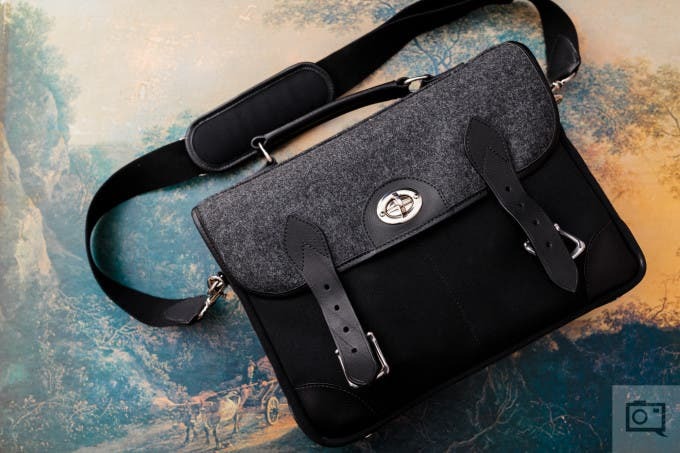 But in true entrepreneurial spirit, I’m always thrilled when a new brand approaches the site with a new product–such is the case with the new Hawkesmill Sloane Street camera bag. The company is based in England, and is determined to grab your attention with their new wares. 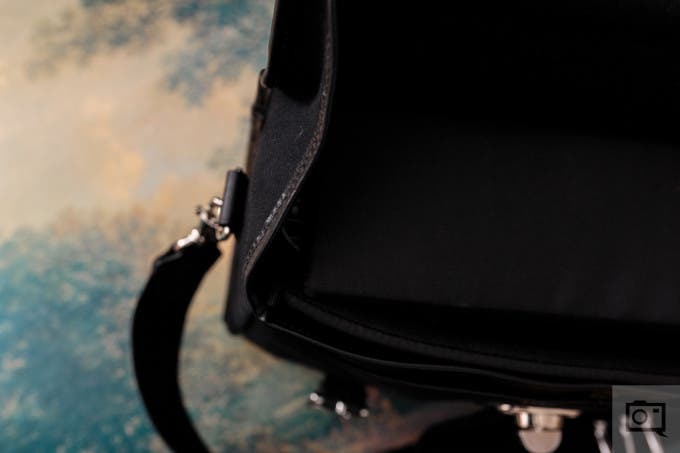 Take the Hawkesmill Sloane Street for example: this high end bag is designed for the photographer that is also a serious business person and that at times needs to embrace a different aesthetic. 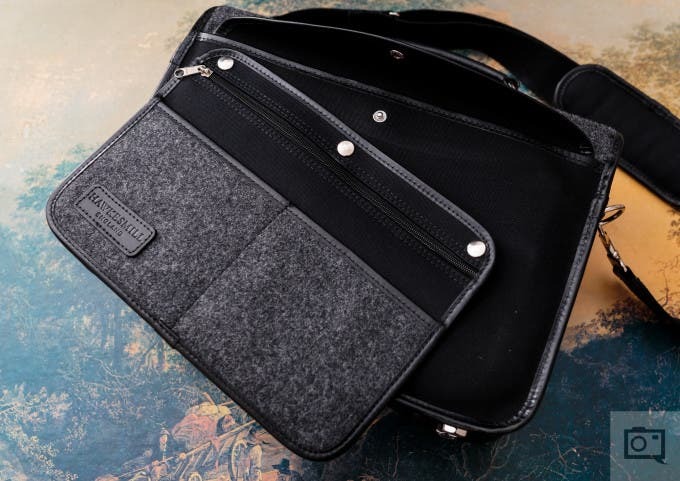 While the likes of Tenba, Think Tank and others make some great practical bags that you may want to bring around for the very general and typical shoot, there are those moments where it would make sense for you to spruce up your look a bit more. That’s not to sit here and defend what some may call a hipster or elitist attitude; instead it’s an embrace of a major reality in the world of a professional photographer who needs to look the part of a business oriented creative at times. And most professional photographers will tell you that they shoot less and do more business. Editor’s Note: I should very clearly state that the lock on the bag isn’t load bearing. So you really should fully close it with the straps when you have products inside and you try to pick it up from the suitcase handle. Amazingly didn’t cause a sweat band on my shirt as I went through extremely warm Miami and San Francisco. I wouldn’t bring it with me everywhere. If I’m walking home late at night or in a dangerous part of Brooklyn, I’m probably not bringing this. But if I’m heading to a shoot on a rooftop in Chelsea overlooking the East River then this bag is surely coming with me if I can keep my kit smaller. As an addendum to the previous con, it shouldn’t be used as your general every day bag. Instead, it’s only for special moments or for the enthusiast that wants to use it as an every day bag and then as their camera bag. 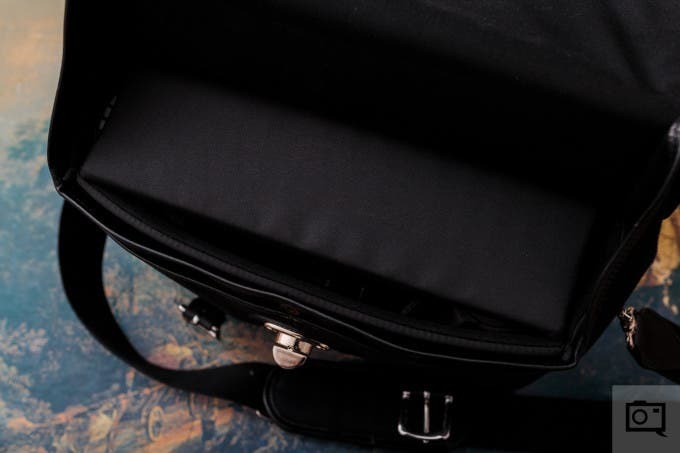 When it’s overpacked, you shouldn’t hold it by the briefcase handle because the lock will come open. For what I stuffed in there though, the lock is very high quality and never snapped. When they’re not buckled down, the front straps kind of just chill out and stand there. It’s arguable that they weren’t needed, but they also serve a security purpose. Side pockets would have been a nice addition, though the back pocket has loads of room. Expensive at approximately $771.00 USD, but I believe it to be worth it if it’s going to last my entire life. 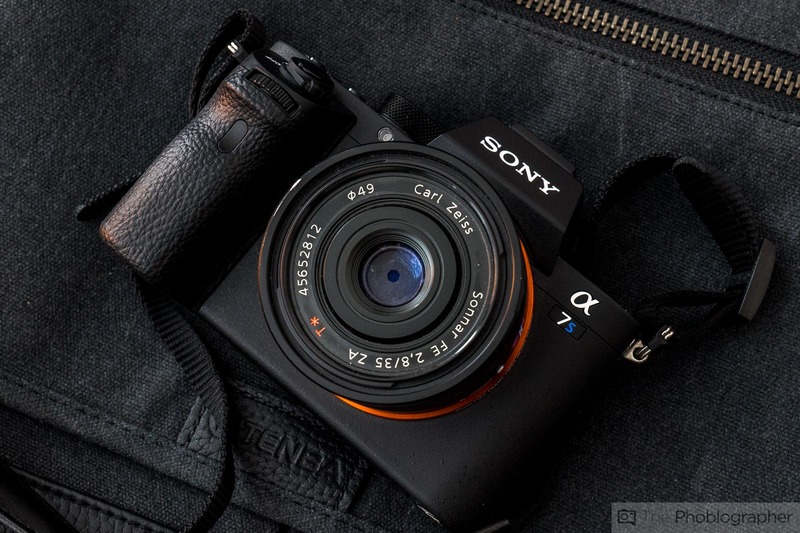 The review of the Hawkesmill Sloane Street was done with the Sony a7, Sony 35mm f2.8, Adorama Flashpoint Zoom Lion flash and transmitter, Sony a6300, Sony 70-200mm f4 OSS, Sony 30mm f2.8, Lensbaby 56mm f1.6 Velvet, Fujifilm X Pro 2, Fujifilm 35mm f2, Nikon N2020 SLR, Canon 6D, Sigma 35mm f1.4, Phottix Odin and Mitros + and that’s about all. At other times the bag was stuffed with my 13 inch Macbook pro, my Sony headphones, vitamins, Advil, hand sanitizer, etc. Size – 15.7”x11”x5” – Weight varies on bag – 3-6lbs with insert, shoulder strap & rear sleeve. Main body material used – triple layer waterproof canvas. Made in Scotland. Flap material used – varies – Harris Tweed (woven in Scotland), or triple layer waterproof canvas, (made in Scotland). Fittings used – nickel. Custom, branded feet and trigger hooks used. Many of the fittings we use are made in England. Our turn lock is made in Italy. Methods used to open and close bag – turn lock for ease of use with one hand, front double leather straps and buckle for security. Removable insert – padded, can fit 15” MacBook. Can be removed so bag can be used as a weekend bag, carry-on bag, etc. Bottom feet are removable and can be replaced when worn. 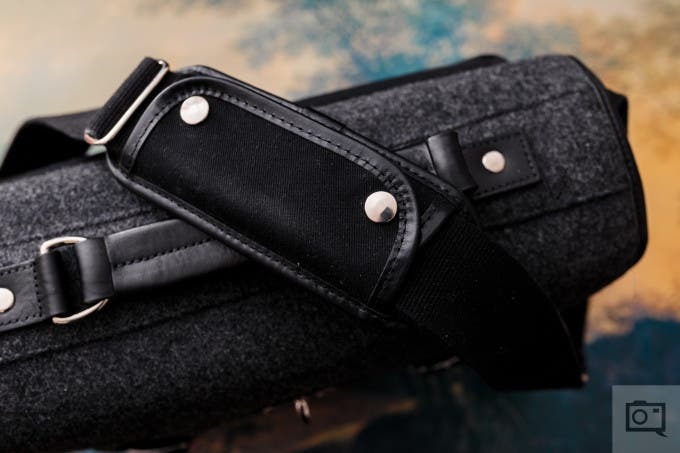 Sloane Street bag (charcoal Harris Tweed flap, black triple layer waterproof canvas body), leather is Italian bubble. Bond Street bag (black triple layer canvas flap, black triple layer waterproof canvas body), leather is Italian bubble. Jermyn Street bag (Lovat Harris Tweed flap, deep olive triple layer waterproof canvas body), leather is Italian bubble. Marlborough bag (18oz Superdry canvas flap, 18oz Superdry canvas body, made in Scotland), leather is English Bridle. Handle is securely riveted to steel bar, running through top of flap. Rivets are used on every stress point, including: front straps, shoulder strap, turn lock and handle. Bag is waterproof and dust proof. The gusset has been made to fold into the flap to stop water and dust ingress. Warranty – Lifetime against defects. Price: £549 including VAT (where applicable). 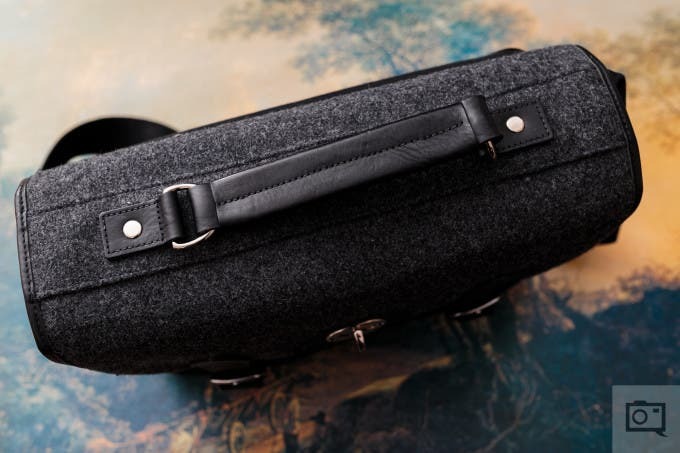 The Hawkesmill Sloane Street camera bag is characterized with a tweed layer on top, lots of black, black leather, and nickel fasteners. 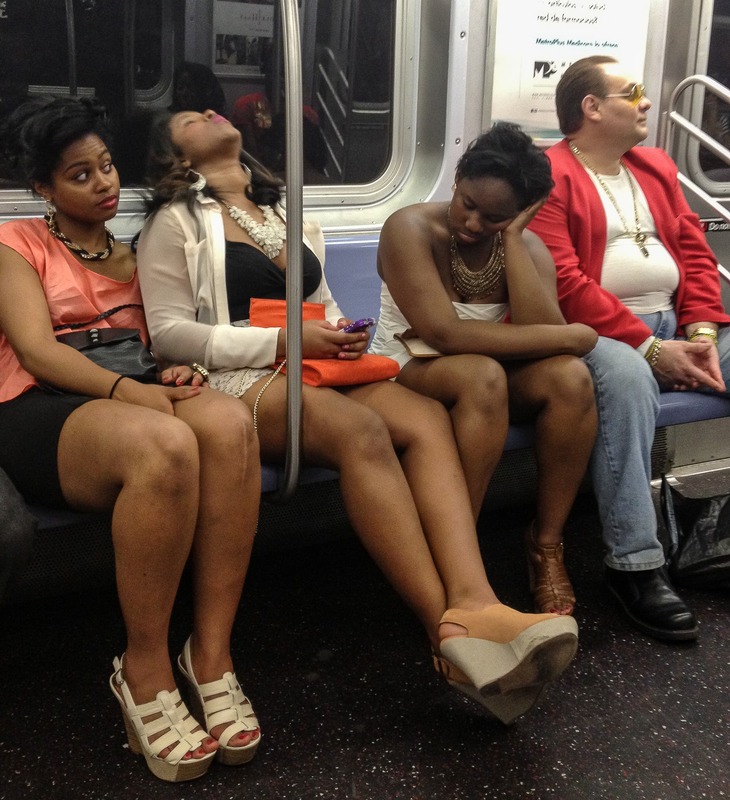 Not brass–nickel! It’s high end for sure! The bag has three layers of full security. You’ve got the middle nickel turning knob, and the left and right leather straps. For quick access, you’ll want these straps undone and only using the knob. At first, I was a bit confused by this design–but in real life use it actually made sense. The top of the bag has this suitcase handle. It’s built well, comfortable enough, doesn’t make your hand sweat and is convenient for when you need to quickly grab the bag and go. It’s much more traditional as opposed to Tenba’s design that puts the strap from one side of the camera bag to the other. For elegance’s sake, this serves the purpose. The shoulder strap itself has excellent shoulder padding. It’s thick, but not Think Tank thick and a bit more than Tenba thickness. Plus it’s got these snazzy buttons that make the comfort and security a bit better. Before we go inside, let’s head around to the back of the Sloane Street. The back has a giant pocket and inside said pocket, you’ll find this special case. In many ways it reminds me of the old pencil cases I had in first grade; but it’s far more functional. You can sort stuff accordingly with this pocket. See all the nickel buttons and knobs? It can snap into place using these. For what it’s worth, I never used this thing and instead opted to go into the jungle like a man. Chargers, hanitizer, my phone, film, etc all got stuffed into here. Open the top up and what you’ll find are two very low profile front pockets. The main compartment comes with a giant padded divider section with a top that closes down to protect the gear inside. Lift up the top and what you’ll find are dividers for camera gear and a laptop. This image is fairly self explanatory. This whole section is attached to the inside by the use of nickel buttons. It’s nice for quick and quiet access/removal. When the top flap comes up, what you’ll find are these little flaps that come up from the side for protection of the gear inside. You don’t find this often, but it’s a nice touch for sure. Tenba, ONA, Peak Design, z-Kin, and Think Tank all create well-made messenger bags; but Hawkesmill makes Well-Made messenger bags. This bag survived a slurry of rain in New York, a bit of snow, travelling through airport scanner after scanner, etc. What really impressed me though what the implementation of the turning knob. When the bag has been packed with gear, I’ll sometimes grab the suitcase handle in a hurry and the knob will turn and relieve its weight by opening up. But it’s never come apart. In some ways I prefer this, but for what it’s worth absolutely nothing is beating the Peak Design locking mechanism. My usage reminds me to grab the shoulder strap, so that just makes sense for me. If it ever broke, I know that I’ve got a lifetime warranty. However, that still means that I need to fight my instinct to grab the handle and go. If the front leather straps are secured, then I don’t need to worry about the top flap coming undone because there is the extra security that really can’t be beat. Long days and nights in airports and on airplanes have taught me more about using the bag properly. At the same time, this bag is bound to draw attention. Typically when I go to press events, PR reps and other journalists will want to know what I’ve got on me because it tends to look really cool and they all know that I tend to be discerning about the products I use. Considering how sturdy this bag is, if I break it, I alone am the reason why I can’t have nice things. There is a lot that this bag can offer if you really just choose to utilize all of it. However, some parts like the front pockets, are so low profile that you can forget that they’re there. And if you pack them with gear, make sure that the gear is thin because otherwise they’ll bulge. A part of me wishes that the bag has side pockets, but in real life use it didn’t really matter as much. I’ve got pockets on my jeans and the extras were stuffed into the back pocket of the bag. For what it’s worth, the interior divider system is the best designed that I’ve seen. Something about it makes taking apart and replacing the dividers very simple without having the velcro get caught on the sides and having you need to readjust them. This simplicity is obviously something that you’re paying for–and the peace of mind that I get as an already busy editor and shooter is highly appreciated. The bag is most secure when the straps are buckled and the turning knob is in its rightful place. Undoing the straps isn’t that tough, but it surely is an extra step. For security though, I appreciate this. For quick access, I’m fine undoing the knob and having the straps unbuckled. 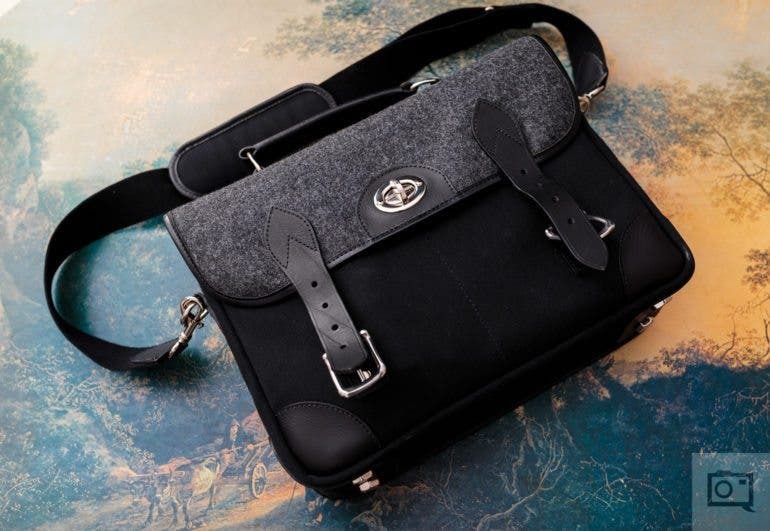 There’s a lot to like with the Hawkesmill Sloane Street camera bag. 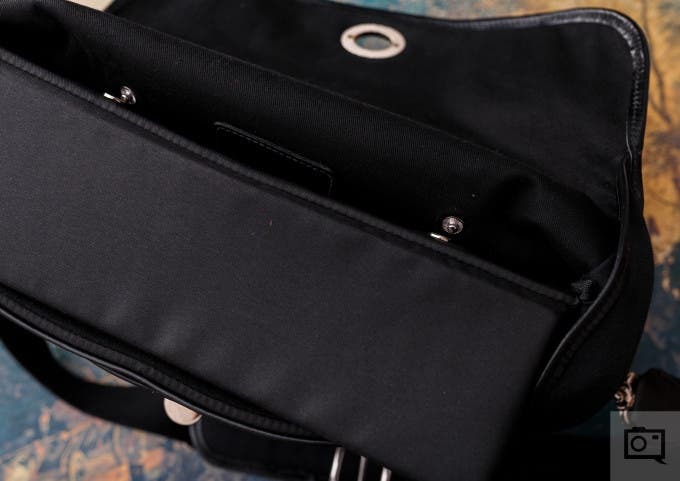 It’s the single best made messenger bag out there, it’s handsome, has a lot of security, uses nickel instead of brass, has lots of room, lots of padding, a comfortable shoulder strap, a solid suitcase handle, pockets, more pockets, and overall it makes someone not think that you have a camera bag. Instead, it’s easy for one to think that you’ve just got a really nice briefcase. Again though, I wouldn’t use it for everything. My zkin Champ is designated for my 35mm and instnnt film cameras, my Cub and Co Shooter bag is for my medium format film stuff, my Tenba Cooper is for general mirrorless camera usage, and either my PRVKE pack or Langly Alpha Pro are for DSLR gear and lighting. But when any of that needs to come with me to impress a client, the Hawkesmill comes with me. And to that end, it leaves a mark. When someone sees it, they know that you’ve got class and that you stand out from the pack. At the same time, it can attract unwarranted attention. In those situations, I’ll go for my Tenba, which is by far the most low profile camera bag I own and appreciate it for its design. But when my game face comes on, make no mistake: the Hawkesmill Sloane Street is coming with me. The Hawkesmill Sloane Street Camera Bag wins five out of five stars and the Editor’s Choice award for the photographer who is also a business person. Check their website or Instagram for more.